The Library of Congress announced today that its American Folklife Center has acquired the Aaron Ziegelman Foundation Collection, a large collection of rare photographs, motion pictures, letters, maps and other materials that richly document everyday life in the Jewish community of Luboml, Poland, prior to its obliteration during World War II. The collection was donated to the Library by Aaron Ziegelman, of New York City, the creator of the collection, who is the executive director of the foundation. The materials in the collection provide a unique window onto the traditions and other aspects of Jewish life in the market town or "shtetl" of Luboml (Libivne in Yiddish). Luboml, established in the 14th century, had one of the oldest Jewish communities in Poland, and is representative of other Eastern European shtetls. Located 200 miles southeast of Warsaw, it is now part of Ukraine. Materials in the collection document, for example, local schools, businesses, recreational activities, religious life, holidays, and weddings. Aaron Ziegelman was born in Luboml and left the community, with his mother and sister, in 1938 and came to the United States, where he became a successful businessman. To enrich his memories of the vibrant community of his childhood and share the story of Luboml's Jewish past, Ziegelman organized a project to collect and preserve information about Jewish life in Luboml obtained from survivors and other sources, beginning in 1994. 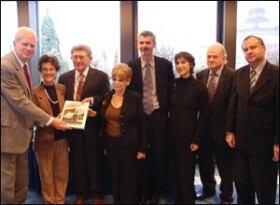 The creation of this documentary collection led, in turn, to the development of a major traveling exhibition titled "Remembering Luboml: Images of a Jewish Community"; a book, "Luboml: The Memorial Book of a Vanished Shtetl," and a recently released documentary film, "Luboml: My Heart Remembers." The Aaron Ziegelman Foundation Collection will reside at the Archive of Folk Culture, which is part of the Library of Congress's American Folklife Center. "We are thrilled that Aaron Ziegelman has donated this wonderful collection to the Library of Congress," said Peggy A. Bulger, the center's director. "It is an incredibly rich collection that will permit researchers to better understand myriad aspects of a Jewish community's culture as they existed before World War II." The American Folklife Center was created by Congress in 1976 and placed in the Library of Congress to "preserve and present folklife" through programs of research, document-ation, archival preservation, reference service, live performance, exhibitions, and training. The Center includes the Archive of Folk Culture, which was established in 1928 and is now one of the largest collections of ethnographic material from the United States and around the world. To view this release on the Library of Congress web site, click here. The Memorial Book of a Vanished Shtetl, was given to the Library of Congress along with a large collection of rare photographs, films, letters, maps and other materials documenting life in the Jewish community of Luboml, Poland, prior to its obliteration in World War II. The Luboml Archive was donated to the Library of Congress by Aaron Ziegelman of New York City who organized the collection, beginning in 1994, to gather and preserve information about Jewish life in the vibrant community of his childhood and share it with the world through the book, a traveling exhibit "Remembering Luboml: Images of a Jewish Community", a documentary film, "Luboml: My Heart Remembers" and this web site. Ambassador of the Republic of Poland.